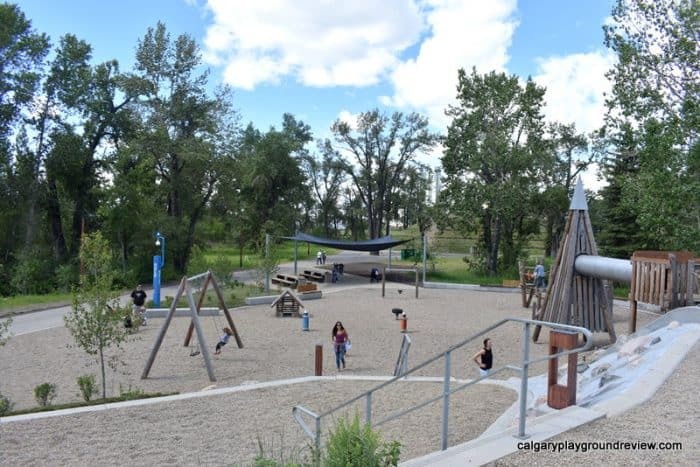 Surrounding Park Area: Located in the newly redeveloped St. Patrick’s Island Park. 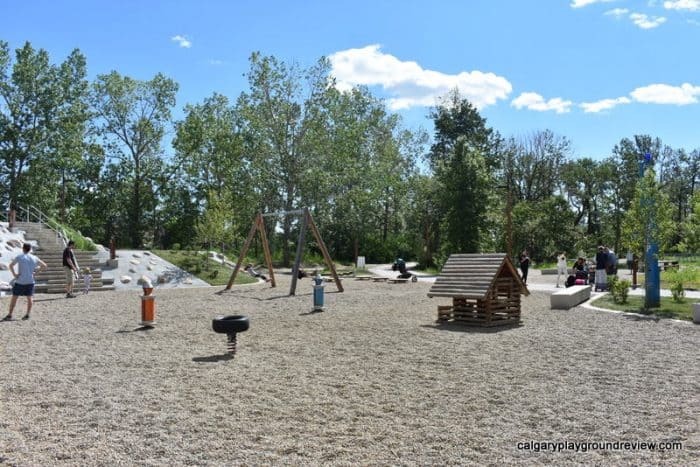 Washrooms, river wading area, large hill for tobogganing, plaza, picnic areas, pathways. 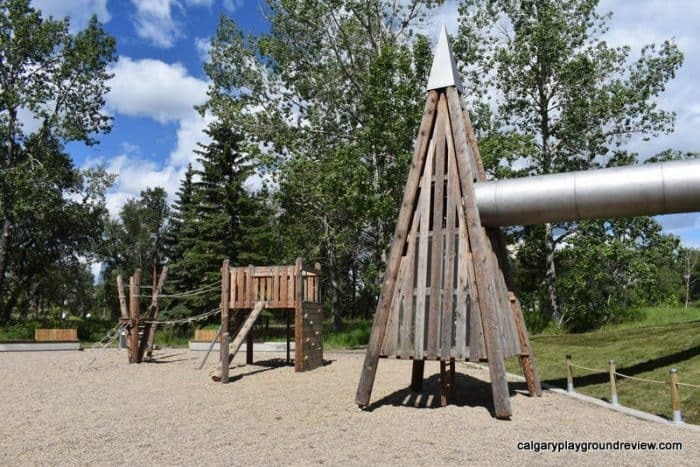 Playground Features: 1 hill slide, triangle tower with tunnel and rope bridge, small playhouse, wobbly balance beam, wobbly platforms, 2 spinners, bouncy teeter totter, 3 swings (1 baby). climber with ropes and climbing wall. Climbing boulders. 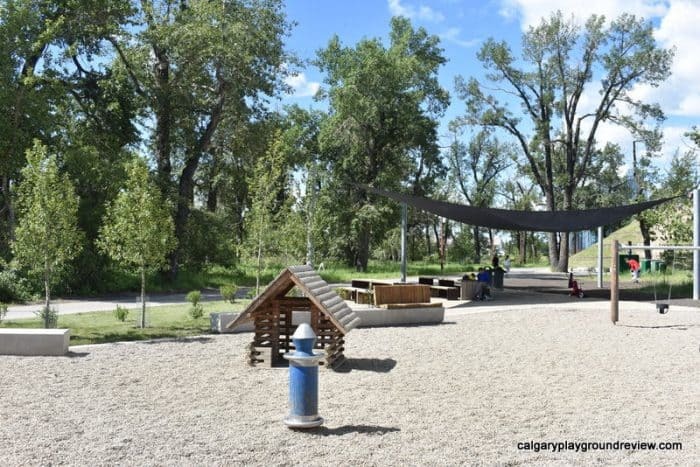 Seating: Several concrete benches, Picnic area with sunshade next to the park. 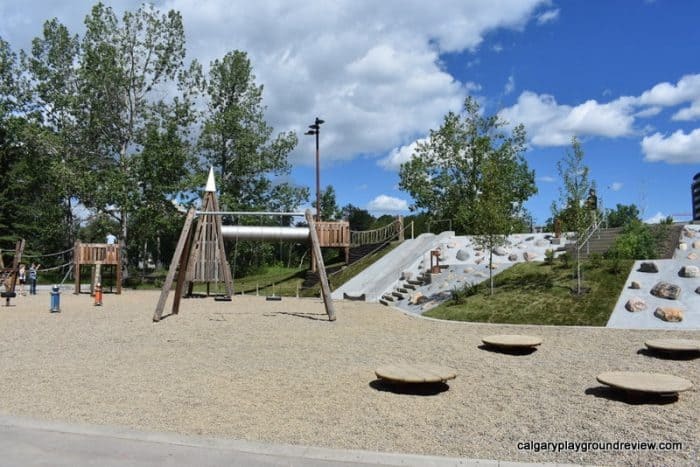 Overall assessment: This playground was brand new in 2015 as part of the St. Patrick’s Island redevelopment project. 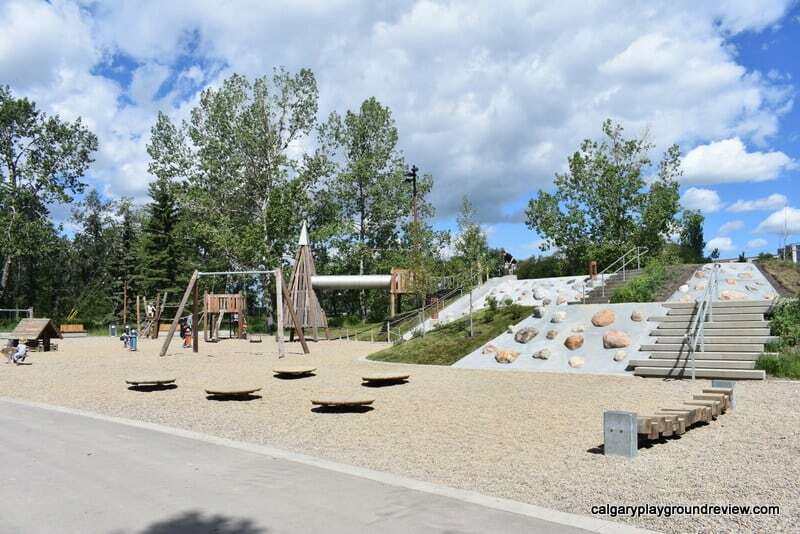 It was then redesigned in June 2017 – the metal hill slides were replaced with one concrete slide and climbing rocks were added to the hillside. 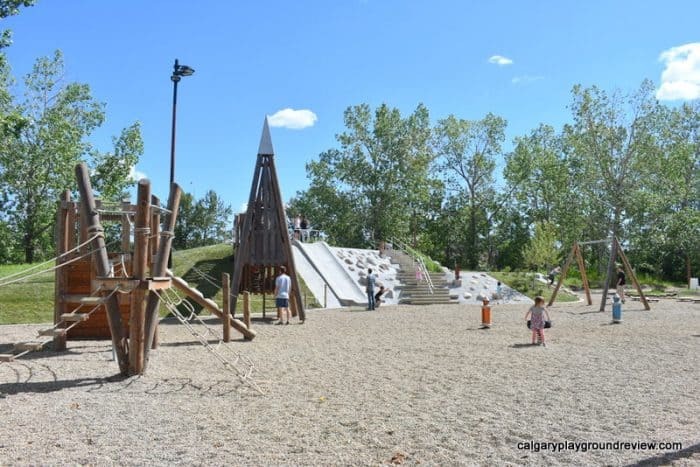 Older kids will love the climbing structures and the hill slide. 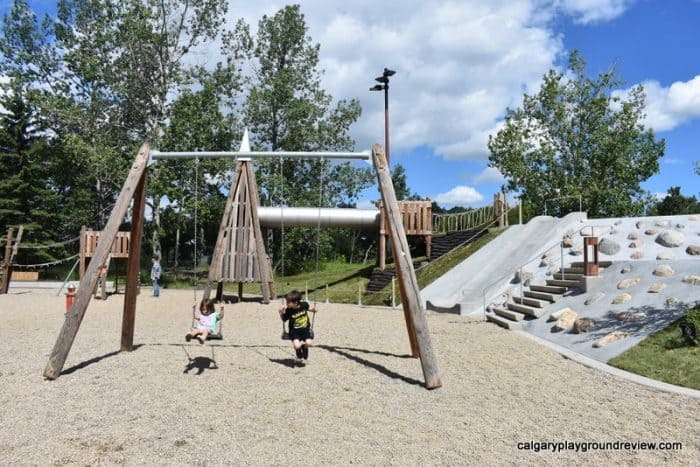 Toddlers will find the climbing structures a little challenging but will still enjoy many of the other playground features. The playhouse is quite tiny – this makes it perfect for toddlers though as the bigger kids will tend to stay out. 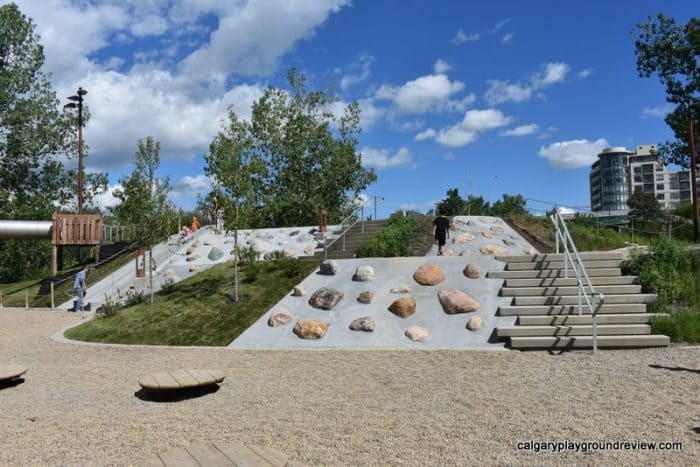 The climbers here are really different compared to other Calgary parks and my older kids both really enjoyed trying them out. 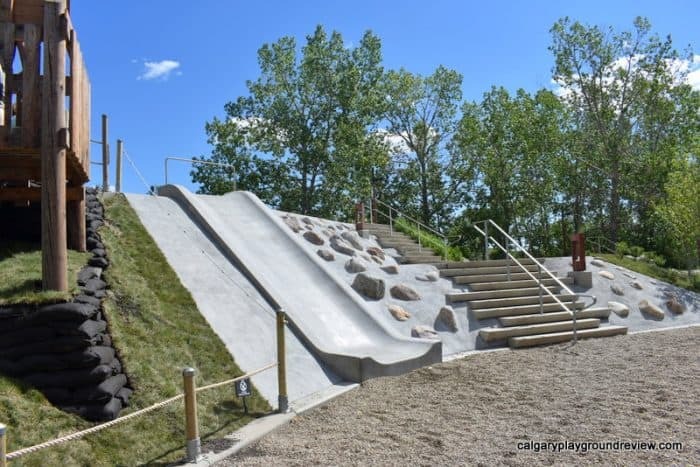 The top of the slide area is open at the top and leads (un-invitingly) down to the river so be aware if you have a child with a tendency to wander. 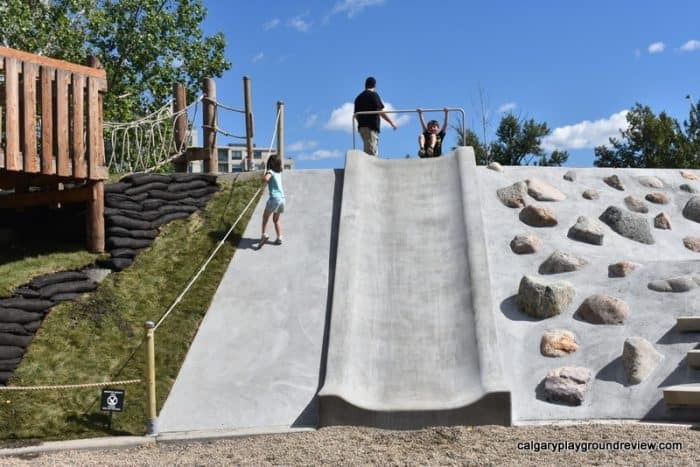 Also, the hill slide is not particularly comfortable for adults. 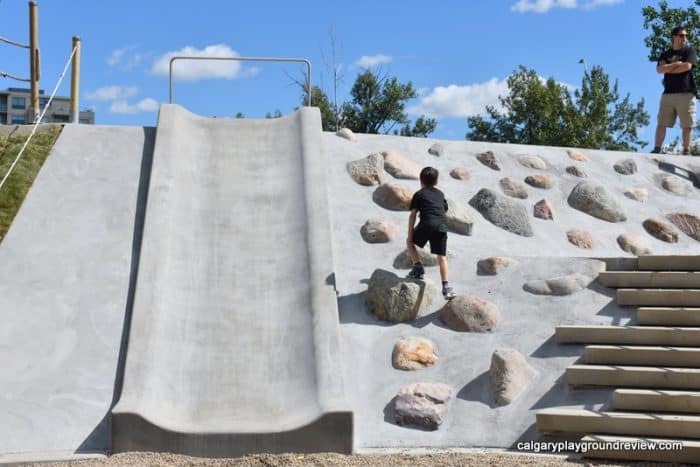 Very young kids may find it a bit steep – if you child might fall backwards while sliding you may want to wait until they are a bit older. 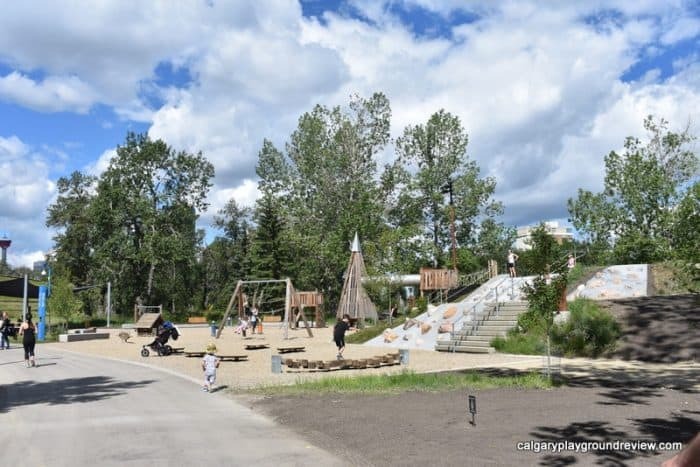 Although this playground is great the surrounding park is what really makes this a family destination. 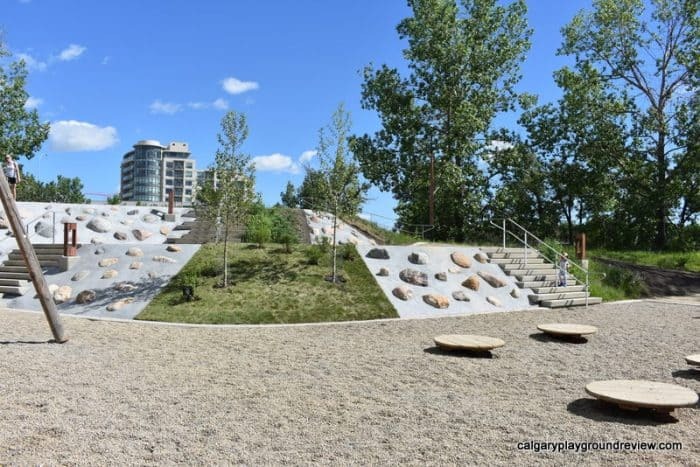 Check out my review of the St. Patrick’s Island Park itself. 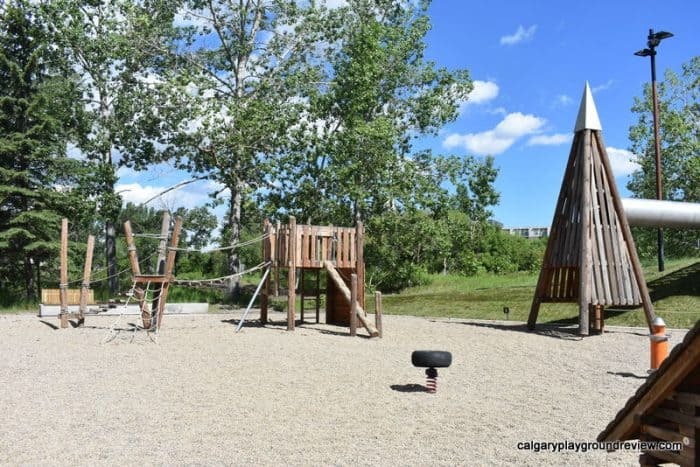 Thank you for the info on this park. It’s very useful to have photographs and a site layout on this page. Thank for all the work you do on this website… I am a frequent visitor! We went again this weekend, there were city workers with games like Bocce, soccer and giant Jenga at the rise (the big hill). They will have extra programs like that all summer (not sure the exact details). We were 4 adults and 3 kids (3,5 and 8) and everyone was entertained for hours. It is definitely a place you could do spend a day and not get bored because of the different areas. Next time we’ll bring swim gear. I thought the water was freezing but my kids went all the way in and loved it! Sweet! I had no idea this even existed. 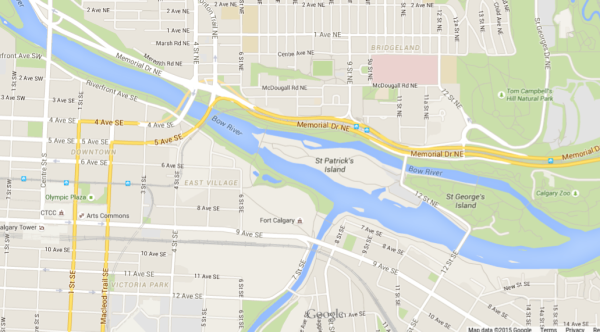 Going to head there today. Thanks! 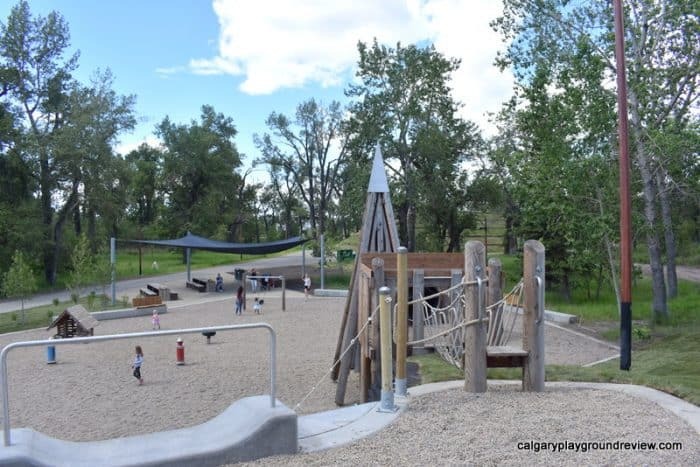 We loved all the features at the St. Patrick’s Island playground. However, the slide is brutal. 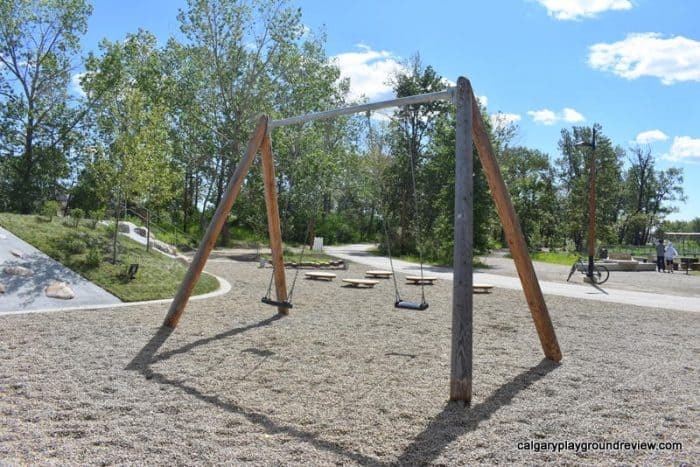 It ejected little kids face first right into the pea gravel. 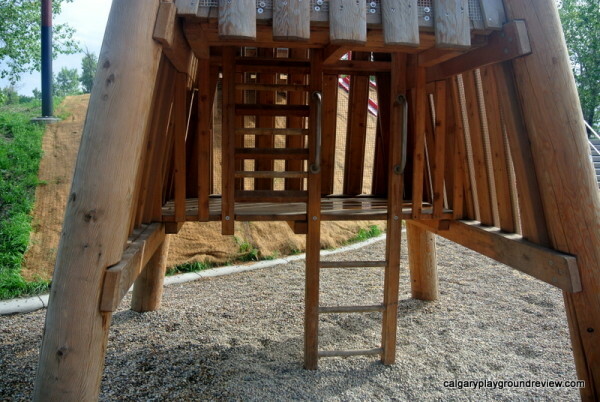 I went down it with my granddaughter and smashed my tailbone at the bottom. The slide angles at the bottom instead of scooping. Please take the angle out of the slide. 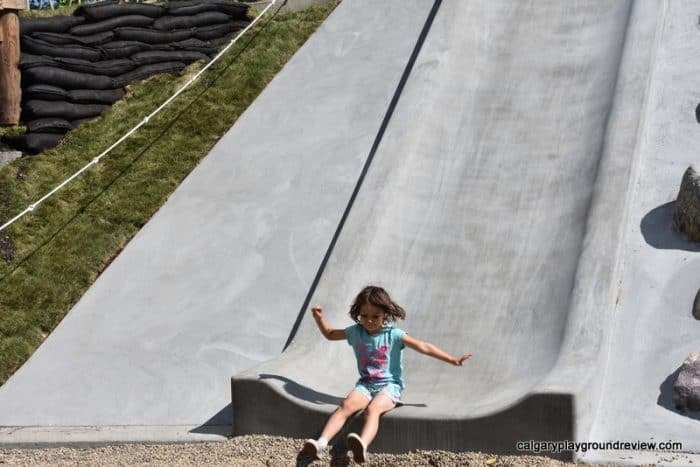 I talked with several other adults who hit their tailbone at the bottom while sliding down with their little ones.